Early Learning: Talk, Read, and Sing Together Every Day! Early Learning: Talk, Read, and Sing! Tip Sheets STEM Every Day! Below are various tip sheets to assist families, caregivers and early learning educators. All children are born with the need and desire to connect with those around them. Neuroscience tells us that brain development unfolds rapidly in the first three years of life, and that social and emotional development begins in the earliest days of life. When children feel secure in their relationships and have their needs met in responsive and consistent ways, they begin forming strong social and emotional foundations. They begin to learn to pay attention, regulate their emotions and behavior, express feelings, and overcome challenges successfully. All of these skills contribute to healthy social and emotional development. Many parents and caregivers, as well as teachers and early learning providers, are eager for information and resources on how to connect with babies and toddlers, manage young children's behavior, and help children develop relationships, regulate their behavior and emotions, and talk about their feelings. When the adults in children's lives have appropriate expectations of children's development at different ages, they have greater successand much less frustrationwith young children. Building on prior successful partnerships to promote early brain and language development and early STEM education, the U.S. Departments of Education and Health and Human Services have joined with Too Small to Fail to release a Social and Emotional Toolkit on social and emotional development. All of the resources feature examples of simple actions to take, some of which caregivers might be doing already, such as maintaining consistent routines for young children. From birth, children are curious. You can build on that natural curiosity by developing their interest in science, technology, engineering and math (STEM). Use daily routines to build on skills and concepts in math and science. By talking, reading, singing, playing, signing or using other ways to communicate—whatever works best for your infant, toddler or preschooler—you can help develop her STEM skills through play and exploration. Easy ways to promote young children's natural abilities as scientists and engineers is by encouraging them to document their observations by drawing, painting, or recording their voices describe what they are noticing; constructing towers with blocks or other objects; and talking about the changes in nature—like the weather! The White House, in partnership with the U.S. Departments of Education and Health and Human Services, hosted a convening to highlight the importance of promoting active STEM learning for our youngest children and to celebrate a broad range of public- and private-sector leaders committed to promoting STEM learning across the country. The Departments and Too Small to Fail have created a set of early STEM resources for families and educators of young children entitled Let's Talk, Read and Sing about STEM! These tip sheets provide fun, concrete resources and recommendations for families, caregivers, and infant, toddler, and preschool educators on easy ways to incorporate STEM concepts and vocabulary into everyday routines, and suggestions for activities to engage young children in STEM learning. Research has found that providing children from birth to five with consistent, language-rich experiences—such as talking, reading, and singing—can have important benefits on their brain development and future school success. However, many families lack access to the types of resources that can help them make the most of these language building experiences. This creates a gap in the quantity and quality of words that children learn, which directly impacts their opportunities to succeed in school and later on in life. As the result of a commitment made at the White House Summit on Early Education convening focused on increasing the quantity and quality of words that children learn, the U.S. Departments Education and Health and Human Services, in partnership with Too Small to Fail, have created the "Talk, Read, and Sing Together Every Day" tip sheets. Made specifically for families, caregivers and early educators, these resources can help enrich a child's early language experiences by providing research-based tips for talking, reading, and singing with young children every day beginning from birth. 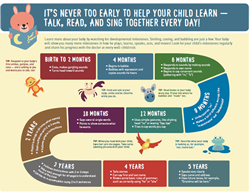 It's Never Too Early to Help Your Child Learn Talk, Read, and Sing Together Every Day!